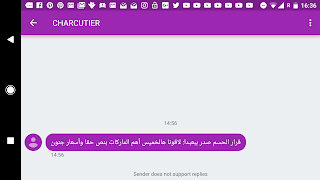 Anyone who thinks it is complicated do a great ad, look no further than the Le Charcutier SMS sent about their Thursday (today!) sales. "The forceful decision has been taken in Baabda: Meet us this Thursday where major brands are marked down to half-price". If you are missing the joke, Baabda is the presidential palace location, and "forceful decision" refers to the many entangled dossiers which go through the presidency in a country which rests on a very delicate equilibrium such as Lebanon. To top it all "7asm" or foreceful also means "discount"... Well done indeed!